Check out these great marinated and baked tofu recipes. Baked tofu is low-fat and low-carb, vegetarian and vegan. You can eat baked tofu as it is, or add it to salads, pasta or vegetarian stir-fries. If you like baked tofu, try these flavorful marinated tofu recipes. The sugar in barbecue sauce is really what makes this method of making baked tofu (it's so easy it's hardly a recipe!) work so well, so make sure you use a barbecue sauce with some added sweetener. I like to use a good quality Texas style barbecue sauce and serve on sourdough bread to make barbecue tofu sandwiches! If you're new to cooking with tofu or have never made baked tofu before, this is a great recipe to try because it is so easy and completely foolproof. I love Thai peanut sauce, and I love baked tofu. Therefore, this baked tofu in Thai peanut sauce recipe is pretty much the best thing ever. Don't try to skimp on store-bought peanut sauce, as you really do need the extra sugar (in this case, in the form of maple syrup) in order to get the right effect. This sesame ginger baked tofu recipe is an easy baked tofu recipe, inspired by the flavors of Asia. Simply whisk up a marinade and bake! Because this baked tofu recipe is so easy, it's a good one to pair with a vegetarian noodle recipe or to top off a vegetable stir-fry for a simple and healthy vegetarian dinner. Three different reviewers have all given this breaded tofu "chicken nuggets" five out of five stars and agree they're very tasty and similar to chicken nuggets, whether baked or fried (the recipe includes instructions for both baking and frying). I've made these with both regular breadcrumbs and panko, and they always turn out fantastic, no matter what. Adding lemon juice and seaweed creates a fishy flavor to a breaded and baked tofu. Dip these tofu "fish" sticks in tartar sauce for an even fishier flavor. Though the recipe calls for nori seaweed, any kind will do, so try using dulse or kelp, or whatever you can find in your grocery store. For an extra "fishy" dish, serve these tofu sticks with a homemade vegan tartar sauce. Korean BBQ may have reached it's peak as a food trend a few years ago already, but that doesn't mean that the spicy sweet flavors of Korean barbecue sauce aren't still just as delicious. 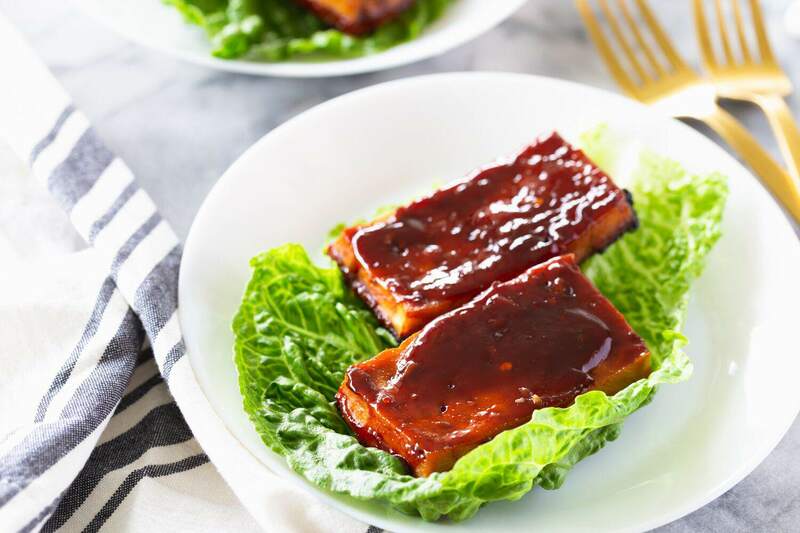 Try this simple baked tofu with a homemade Korean barbecue marinade. You can thank me later. It's incredible. These little tofu nuggets are baked in a sweet and spicy sauce for a delectable dish. If you like baked tofu, try this easy sweet and spicy baked tofu recipe. Go ahead and make a double batch. They're just that good (and easy to make, too!). In this vegetarian baked tofu recipe, tofu is coated in cornmeal and a few spices then baked until crispy. Like most breaded and baked tofu recipes, you can also pan-fry this tofu in a bit of neutral flavored oil, such as canola or safflower oil. Don't forget a bit of ketchup, ranch dressing or barbecue sauce to dip it in! A saucy baked tofu with lemon, Dijon mustard with basil and a bit of thyme for flavor. A reviewer gave this lemon baked tofu recipes five out of five stars and said, "Very flavorful, I devoured half the block right out of the oven." Hmm, maybe you should make a double batch because it's just that good! Chinese five spice is a unique taste that certainly isn't for everyone. If you have "undeveloped" Western taste-buds, you may want to cut the amount of five-spice required in half, but, if you like Chinese 5-spice or authentic Asian food, you'll love this easy baked tofu recipe. A salty and savory tofu dish broiled in the oven to create a crispy golden brown crust. If you like miso, this is a great recipe to try. Delicious on its own or in vegetarian sandwiches or wraps. A fresh basil and Parmesan cheese breading lightly coats these baked tofu and pesto cutlets. Bake them in the oven, or, if you're not concerned about a bit of added fat, they work well pan-fried in a bit of oil as well. Try serving them topped with a bit of extra pesto, or drizzled with a gourmet flavored olive oil.